In the commercial, which advertises what is essentially a smart tax prep service, Watson is portrayed as a glowing sci-fi cube that holds the key to humankind’s greatest problems. But it’s not a wizard. And lately, several experts from Silicon Valley and Wall Street have spoken up, criticizing the people behind the curtain—asking if Watson is a joke or a savior for IBM. So why is everyone being so tough on Big Blue and its golden child? 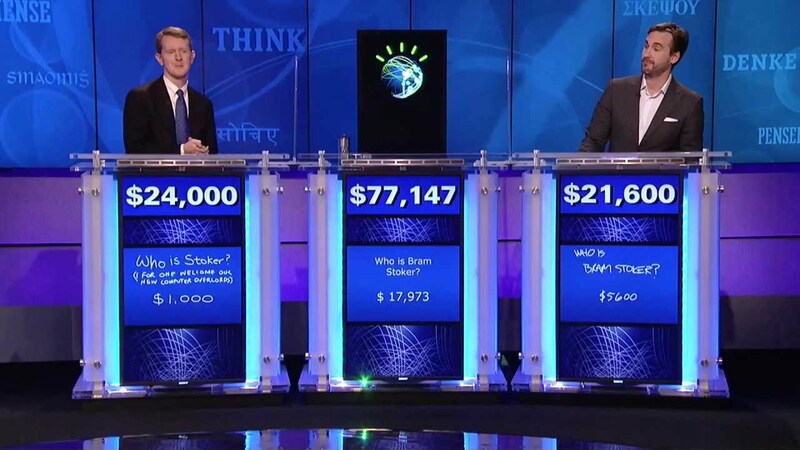 The splashy vision of Watson has been integral to IBM’s branding since the groundbreaking question-answering system made its debut in 2011 on Jeopardy! Now, thanks to billions of dollars of investment and years of aggressive marketing, Watson has come to represent AI in the popular imagination. Siri and Alexa may get more attention these days, but when it comes to big-data computing, Watson was the first to offer up its name, and it has remained a cocksure mascot. IBM seems to believe the Watson brand can breathe new life into their company. And it sure could use some resuscitation right about now. IBM’s revenue has fallen for 22 consecutive quarters. In May, Warren Buffett dumped about a third of his IBM stock, citing “some pretty tough competitors.” Two weeks later, the Wall Street Journal reported IBM gave its remote employees the option to either move to a regional office or quit. (Since the decision affects more than 40 percent of its 380,000 employees, the article suggests it’s a way of cutting employees without official layoffs.) Then in July, investment bank Jefferies published a report cautioning IBM investors, suggesting the company won’t return value to shareholders because it can’t compete with other tech giants investing in AI. Amazon, Apple, Facebook, Google, and Microsoft are all retooling their businesses around the belief that AI and machine learning are the future of the tech industry. IBM is in a more vulnerable position than all those companies. Even though IBM was an AI pioneer it has let its lead slip and damaged its reputation with overhyped marketing. There’s a rising sentiment in from tech and finance experts that, for all the idealism, Watson just can’t deliver on its promises. Watson was more than just a supercomputer that answered trivia questions. It could process natural language, including wordplay and unusually phrased questions. When Watson was given a question, dozens of algorithms analyzed the query and produced a list of responses, then ranked the answers. If the confidence score was high enough, Watson hit the buzzer. Many of the products mentioned in those articles rely on machine learning—algorithms that “learn” how to perform tasks by processing massive amounts of data (hence the buzzword big-data computing) and finding patterns in the information. It’s kind of like how you know where to feel for a light switch in a new dark room thanks to association and repetition. But it’s not always easy to get all that data. One way IBM gets it is by acquisitions of companies with large datasets, like Truven Health Analytics and the Weather Channel’s digital assets. Watson’s natural-language capabilities help the system understand the jargon of that field and process the data better. IBM then works with experts in various fields—oncologist, chefs, accountants—who “teach” Watson how they do their jobs. Watson Health is a separate unit developing and acquiring AI that can process massive amounts of health-related data—clinical studies to skin images to genome sequencing—and creating tools that will help medical professionals. There are two main branches within Watson Health—Watson for Oncology, which essentially suggests cancer treatments based on the patient information that a doctor inputs, and Watson for Genomics, which works similarly but based the genomic sequencing data of a patient’s tumor. The dream is bespoke medicine and therapies. In the IBM Watson Experience Center in New York City, IBM demonstrated for me a simulated version of Watson that pulls information from millions of medical journals, and processes a patient’s personal information, symptoms, and gene sequencing and, then serves up a diagnoses and path to recovery. There’s no telling if or when we’ll see that version of Watson. But hospitals in China, India, South Korea, and Slovakia—as well as one in the US, Jupiter Medical Center in Jupiter, Florida—use Watson for Oncology for virtual second opinions on treatment options. Sujal Shah, an oncologist at Jupiter Medical Center, told Gizmodo he has been using Watson for Oncology for about five months—mostly during weekly cancer conferences where all the surgeons and cancer doctors discuss treatment options. He and his colleagues enter data into Watson so it can come up with a treatment plan. “Occasionally we disagree, and so that’s where Watson really comes into use,” Shah told Gizmodo, suggesting the computer can serve as a sort of tie-breaker. In nations like India, where there is a low oncologist-to-patient ratio, doctors can use all the help they can get, and oncologist and chairman of Manipal Comprehensive Cancer Center told Gizmodo that Manipal Hospitals have benefited from Watson and his patients appreciate being able to see recommended treatment options on the screen. Using technology to help doctors treat cancer is a noble effort—no one would disagree with that. AI can have a tremendous impact on health care and many other industries. But the technology doesn’t seem to be advanced enough to have a transformational impact just yet. And Watson technology isn’t especially unique. But IBM’s buzzy marketing is trying to make us believe it is leaps and bounds ahead of anything else. IBM said Guda was using a beta version of Watson for Genomics. The Augusta University Georgia Cancer Center recently began using a new version. Ravindra Kolhe, a lab director at the center told Gizmodo the speed that he gets data back from Watson has added value to his clinical reports. Regardless, Watson is making strides in health care research. Last month at the 2017 American Society of Clinical Oncology annual meeting Watson Health shared five studies showing that Watson has gotten better at providing the same treatment recommendations as doctors with certain cancer types. But according David Howard, professor of health policy and management at the Rollins School of Public Health at Emory University, these are “early-stage studies” and there is a big gap between those results and demonstrating a benefit for patients. Next, researchers would need to perform studies that show physician’s treatments changed after seeing Watson’s recommendations and that those changes resulted in improved patient survival rates. Now, thanks largely to IBM, it is no longer a risk for tech companies to focus on AI. Rather, it is a risk to ignore it. But because IBM wanted consumers to take it seriously in the early days, the company came up with its own flashy, imprecise branding for the fantastic new technology. As other companies have started investing heavily in AI in a time when it’s safer to do so, IBM has stayed on the same course, and Watson is trapped in the same black box.